Serge Like A Pro With Outstanding Ease! NEW Convenient Upper and Lower Looper Air Threading. The MO-1000 easily threads with a strong whoosh of air sent from the electric motor. This amazing function dramatically alters upper and lower looper threading. Insert from 1/2 inch to 1 inch of thread into each threading hole at a time. Press the air-control pushbutton and you are done! The MO-1000 was just simply threaded by air. Just pull a couple of inches of thread to begin sewing away. Release the lever to complete the threading. Even with easily stretched fabrics such as knits and georgette, create beautifully sewn finishes by adjusting the differential feed with the simple dialing of a knob. Adjustments can even be made while sewing. The height of the throat is 72.4 mm. Due to this increased height, the usability of the work space has improved infinitely. The needle area is brightly illuminated. The long-life, energy-efficient and eco-friendly light will not heat up, even after a long period of continuos use. 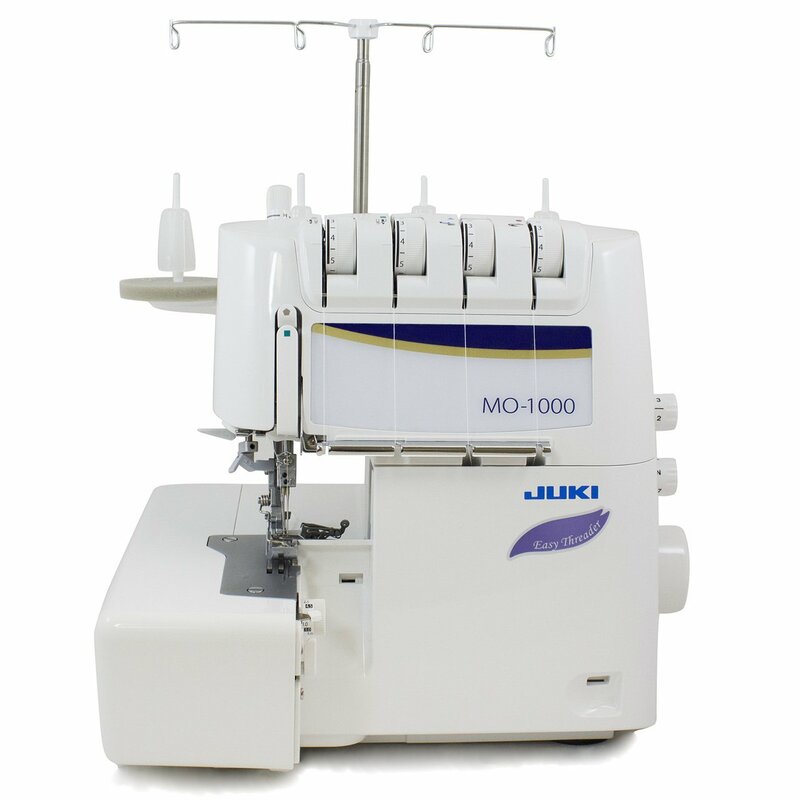 The sound reducing design minimizes operating noise and the MO-1000 sews with less vibration. Infinitely variable adjustments can be made from 1 - 9. Turn the dial downwards for less tension. Turn the dial upwards for more tension. Option to deactivate the upper knife. Safety feature prevents operation when the presser foot is in the upper position or the cover is open. Thread trimming blade for easy thread cutting.